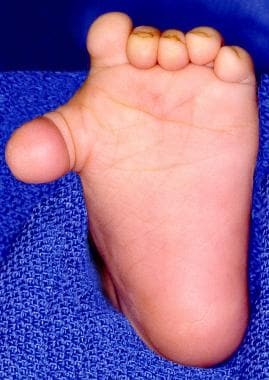 Polydactyly is the most common congenital anomaly of the forefoot. [1, 2, 3, 4, 5, 6, 7] It most commonly refers to the presence of six toes on one foot, but more toes are possible. Accurate understanding of the involved anatomy leads to better clinical results. Radiographs obtained after ossification of the involved bones allow for definitive treatment of the duplicated parts and all associated abnormalities. Greater appreciation of the longitudinal bracket epiphysis, often seen in the first metatarsal in children with preaxial polydactyly, and descriptions that allow for earlier diagnosis and correction of this abnormality lead to better outcomes. Postaxial polydactyly is the most common form,  occurring in 80% of cases, followed by preaxial polydactyly (see the image below) and then central polydactyly. The duplication may range from a well-formed articulated digit to a rudimentary digit. Abnormalities of the associated metatarsal commonly occur in polydactyly. Preoperative photograph of a 1-year-old child with preaxial polydactyly and significant varus of the duplicated toe. Other, more detailed classification systems have also been described (see Presentation). Polydactyly may occur as an isolated trait or in conjunction with certain syndromes, and there is a positive family history in 30% of cases. The syndromes with which polydactyly has been associated include Ellis-van Creveld syndrome, [14, 15] trisomy 13, tibial hemimelia, and trisomy 21. The incidence of polydactyly is 1.7 cases per 1000 live births. The frequency is higher in blacks (3.6-13.9 cases per 1000 live births) than in whites (0.3-1.3 cases per 1000 live births). Polydactyly is bilateral in 50% of cases and has a slight male predilection. Farrugia MC, Calleja-Agius J. Polydactyly: A Review. Neonatal Netw. 2016. 35 (3):135-42. [Medline]. Venn-Watson EA. Problems in polydactyly of the foot. Orthop Clin North Am. 1976 Oct. 7 (4):909-27. [Medline]. Beaty JH. Polydactyly. Canale ST, Beaty JH, eds. Operative Pediatric Orthopaedics. 2nd ed. St Louis: Mosby-Year Book; 1995. 112-4. Hart ES, Grottkau BE, Rebello GN, Albright MB. The newborn foot: diagnosis and management of common conditions. Orthop Nurs. 2005 Sep-Oct. 24 (5):313-21; quiz 322-3. [Medline]. Polydactyly. Herring JA, ed. Tachdjian’s Pediatric Orthopaedics: From the Texas Scottish Rite Hospital for Children. 5th ed. Philadelphia: Elsevier Saunders; 2014. Vol 2: 854-6. Lee HS, Park SS, Yoon JO, Kim JS, Youm YS. Classification of postaxial polydactyly of the foot. Foot Ankle Int. 2006 May. 27 (5):356-62. [Medline]. Turra S, Gigante C, Bisinella G. Polydactyly of the foot. J Pediatr Orthop B. 2007 May. 16 (3):216-20. [Medline]. Morrison BE, D'Mello SR. Polydactyly in mice lacking HDAC9/HDRP. Exp Biol Med (Maywood). 2008 Aug. 233 (8):980-8. [Medline]. [Full Text]. Auyeung J, Bhattacharya R, Birla R, Hide G, Henman P. The occult toe: an unusual case of polydactyly in the foot. J Pediatr Orthop B. 2009 Nov. 18 (6):362-4. [Medline]. Klaassen Z, Shoja MM, Tubbs RS, Loukas M. Supernumerary and absent limbs and digits of the lower limb: a review of the literature. Clin Anat. 2011 Jul. 24 (5):570-5. [Medline]. Lim YJ, Teoh LC, Lee EH. Reconstruction of syndactyly and polysyndactyly of the toes with a dorsal pentagonal island flap: a technique that allows primary skin closure without the use of skin grafting. J Foot Ankle Surg. 2007 Mar-Apr. 46 (2):86-92. [Medline]. Morley SE, Smith PJ. Polydactyly of the feet in children: suggestions for surgical management. Br J Plast Surg. 2001 Jan. 54 (1):34-8. [Medline]. Mubarak SJ, O'Brien TJ, Davids JR. Metatarsal epiphyseal bracket: treatment by central physiolysis. J Pediatr Orthop. 1993 Jan-Feb. 13 (1):5-8. [Medline]. Jenkins S, Morrell DS. Ellis-van Creveld syndrome: case report and review of the literature. Cutis. 2009 Jun. 83 (6):303-5. [Medline]. Sund KL, Roelker S, Ramachandran V, Durbin L, Benson DW. Analysis of Ellis van Creveld syndrome gene products: implications for cardiovascular development and disease. Hum Mol Genet. 2009 May 15. 18 (10):1813-24. [Medline]. [Full Text]. Umair M, Ahmad F, Bilal M, Ahmad W, Alfadhel M. Clinical Genetics of Polydactyly: An Updated Review. Front Genet. 2018. 9:447. [Medline]. [Full Text]. Yucel A, Kuru I, Bozan ME, Acar M, Solak M. Radiographic evaluation and unusual bone formations in different genetic patterns in synpolydactyly. Skeletal Radiol. 2005 Aug. 34 (8):468-76. [Medline]. Adam MP, Hudgins L, Carey JC, Hall BD, Coleman K, Gripp KW, et al. Preaxial hallucal polydactyly as a marker for diabetic embryopathy. Birth Defects Res A Clin Mol Teratol. 2009 Jan. 85 (1):13-9. [Medline]. Belthur MV, Linton JL, Barnes DA. The spectrum of preaxial polydactyly of the foot. J Pediatr Orthop. 2011 Jun. 31 (4):435-47. [Medline]. Seok HH, Park JU, Kwon ST. New classification of polydactyly of the foot on the basis of syndactylism, axis deviation, and metatarsal extent of extra digit. Arch Plast Surg. 2013 May. 40 (3):232-7. [Medline]. [Full Text]. Burger EB, Hovius SE, Burger BJ, van Nieuwenhoven CA. The Rotterdam Foot Classification: A Classification System for Medial Polydactyly of the Foot. J Bone Joint Surg Am. 2016 Aug 3. 98 (15):1298-306. [Medline]. Kubat O, Antičević D. Does timing of surgery influence the long-term results of foot polydactyly treatment?. Foot Ankle Surg. 2018 Aug. 24 (4):353-358. [Medline]. Park GH, Jung ST, Chung JY, Park HW, Lee DH. Toe component excision in postaxial polydactyly of the foot. Foot Ankle Int. 2013 Apr. 34 (4):563-7. [Medline]. Osborn EJ, Davids JR, Leffler LC, Gibson TW, Pugh LI. Central polydactyly of the foot: surgical management with plantar and dorsal advancement flaps. J Pediatr Orthop. 2014 Apr-May. 34 (3):346-51. [Medline]. Nelman K, Weiner DS, Morscher MA, Jones KC. Multiplanar supramalleolar osteotomy in the management of complex rigid foot deformities in children. J Child Orthop. 2009 Feb. 3 (1):39-46. [Medline]. [Full Text]. The Venn-Watson classification of polydactyly is based on the anatomic configuration of the metatarsal and the duplicated bony parts. Postaxial polydactyly in a 1-year-old child. In this case, the duplicated sixth toe was excised (dotted line), and the broad distal fifth metatarsal was narrowed. Postoperative view of 1-year-old child who had postaxial polydactyly and excision of the sixth toe demonstrates a good result with straight lateral border. Postoperative radiograph of a 1-year-old child with preaxial polydactyly who had significant varus of the duplicated toe demonstrates a good result after resection and metatarsal narrowing. Preaxial polydactyly with longitudinal bracket epiphysis. Mother and son with polydactyly. The patterns of deformity are different. Image of an 8-year-old boy with a history of bilateral preaxial polydactyly. He had excision of bilateral duplicated digits at an outside institution. Postoperative radiograph of an 8-year-old boy with a history of bilateral preaxial polydactyly and excision of the duplicated digits at an outside institution. He required additional surgery because of residual deformity. A good result is depicted following combination of the first metatarsal base with the second metatarsal shaft, creating a 5-digit foot. Radiograph depicting a patient who had a history of bilateral preaxial polydactyly and excision of bilateral duplicated digits at an outside institution. He required additional surgery at age 8 years. Good results were obtained following combination of the first metatarsal base with the second metatarsal shaft, creating a 5-digit foot. At 20-year follow-up, the patient is doing well. Disclosure: Received none from OrthoPediatrics for consulting; Received salary from Journal of Pediatric Orthopaedics for management position; Received none from SpineForm for consulting; Received none from SICOT for board membership.